Welcome to Om Amarna, and the annual Horse Festival. It is a time of celebration, drinking, haggling, and thanksgiving. In this first adventure in the cursed land of Tieros, beginning characters will be forced to work together in a race against time to find critical answers in a crowded, diverse, and paranoid city. Answers that will satisfy the Dark Guard and the Cult of Justice. Answers that will save their own necks from the gallows. 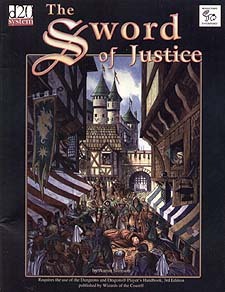 The Sword of Justice introduces Tieros, a land cursed by the acts of an ancient hero, bound by common fate, and diverse in culture and belief. In this adventure characters will become familiar with an exotic new PC race, the fanatical Cult of Justice who worships Law itself, and the ubiquitous Dark Guard, the military power that protects and enforces the peace. Will you survive your first adventure in Tieros, or will it claim your life?